Beyond The Picket Fence: These Are a Few of My Favorite Things and a Surprise Linky Party!! These Are a Few of My Favorite Things and a Surprise Linky Party!! Hey, I would love to see one or two of your favorite posts from this past year--so link on up, either to the original post or a new one featuring favorites that you created this past year. And for my final favorite of the year, I am cheating and including several projects made from free wood from a swing set my hubby took apart and from a neighbor. I still have some bits and pieces so you are bound to see a little more. 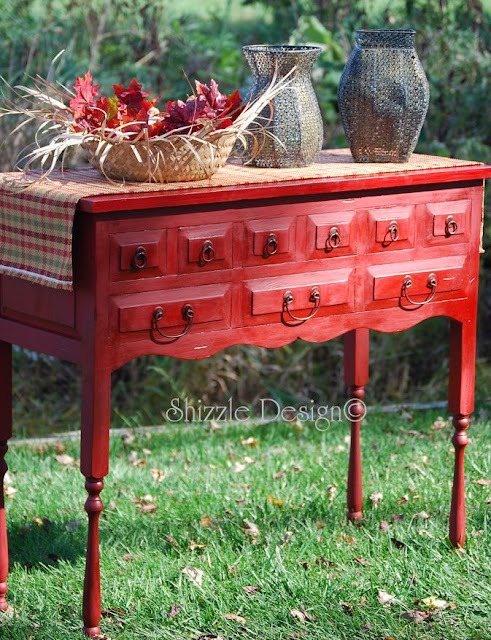 And a final favorite link from the past year--I adored how Shizzle Design took this chest and added legs to it--made it a completely different and fresh piece. Oh, and red is always so right! Have a safe and blessed New Year's Eve all--thank you for all of your support and love this past year. I look forward to new things and new blogging adventures in 2012! Thanks for linking up and for sharing you with us :) !! 2. Please check and make sure your link works. If it doesn't you can delete it and try again. 3. Please no direct links to sales sites, i.e. ETSY or just a plain ol' commercial site, we are looking for inexpensive ideas we can recreate, thanks﻿! I'm still amazed at how many things you made out of this wood. Thanks for this party. It's fun to take a look back. Happy New Year. Love all the colorful and cool projects you made out of wood. Wow, amazing what you can do with a pile of wood! Happy New Year Becky! Wishing you all good things in 2012! I am totally in awe with your amazing creations. I just found you via Villabarnes website. Youre work is terrific and I'm stunned by how many things you made out of that pile of wood! And thanks for the link party! How do you paint the items like that? WOW WOW WOW I JUST LOVE YOUR STUFF !!!!! I LOVE your wood projects! Beautiful! You are so creative and inspirating woman!Thanks for sharing! Again? I must be doing something wrong. Hi there! I am loving the couch table and book shelf. What size wood do you use for the tops? is it 2 x 6's? or 2 x 4's?